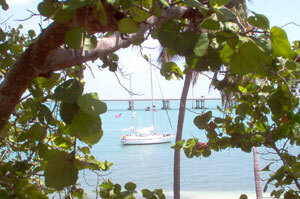 Between the Seven Mile Bridge and Key West, lays a spectacular thirty-mile oasis - Big Pine Key and the Lower Keys. A place to get away from it all, snorkel and dive over coral reefs, explore Key Deer country, fish or troll in the beautiful waters of the Keys. The Lower Keys begin where the Florida Keys island chain takes a turn to the west, shortly after the famous Seven Mile Bridge. A quiet laidback region of small resorts, down-home restaurants, single-family homes, untouched wilderness and the beautiful deep blue waters of the Gulf of Mexico and the Atlantic Ocean. Big Pine Key and the Lower Keys provide many attractions for our visitors to the Keys. Bahia Honda State Park is home to many rare, indigenous plants, flowers, and plentiful wildlife, and has been proclaimed in many travel magazines as having one of the most beautiful beaches in the world. Big Pine Key, while being the main shopping hub for the Lower Keys, is the residence of the Key Deer National Wildlife Refuge where these tiny creatures stand only 2 feet tall! Watch your driving speed here as the speed limit is strictly enforced to protect these deer. Big Pine is also home for the numerous snorkeling and dive charters that will take you to the popular diving site, Looe Key National Marine Sanctuary, which is located about eight miles offshore. One of Florida Keys' artificial reefs – a 210-foot island freighter scuttled in December 1998 – lies halfway between Looe Key and American Shoal or approximately five miles southwest of Big Pine Key. This area also has two of the Florida Keys' most unique landmarks. On Cudjoe Key, you'll see "Fat Albert" (actually this huge white radar balloon or "blimp" can be seen for miles around!) who keeps track of the boat traffic and protects the Keys; and on Sugarloaf Key visit the strange Bat Tower which was constructed in 1929 to house bats to eat mosquitoes (the plan failed terribly!). Come see and explore the Lower Keys for yourself. Plop down in one of the numerous resorts and campgrounds, put on your walking shoes or your fins, and experience memorable jaunts and sunsets in one of the most relaxing, stress-free places in the world – Big Pine Key and the Lower Keys of the Florida Keys.